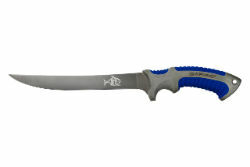 The Flex 9.5 comes equipped with a flexible 9.5" long blade made of Surgical Stainless Steel 5cr15mov. This blade steel along with the Titanium coating will prevent rust & corrosion and provides a non-stick surface. The Large ergonomic handle is designed with security and safety in mind. With the non-slip ribbed rubber grip and the safety finger guard, this handle gives you maximum control and feel. Included is the Nylon sheath with PVC liner. Also GREAT for slicing large Brisket!